It happens to everyone who lives in Seattle at some point—you plan a day outside only to wake up to rain. Fortunately, there are many things to do in the Emerald City when it’s cloudy and grey. Seattle is home to award-winning art museums (The Seattle Art Museum is a favorite), conservatories, and animal exhibits at the zoo and aquarium. Seattle’s museums are spread out all over the city, but there are many to choose from that suit just about all interests—even if you have small children. Seattle Children’s Museum and KidsQuest Children’s Museum in Bellevue are perfect for families with younger children who need to get out and be active. Both museums have lots of hands-on exhibits and play spaces. Meanwhile, Seattle's art museums are also world class. The Seattle Art Museum (SAM) is the largest, but Henry Art Gallery, Frye Museum, and the Seattle Asian Art Museum are other excellent choices. Explore Seattle’s historic side at the Museum of History and Industry (MOHAI), the Nordic Heritage Museum in Ballard, or Museum of Flight to the south. Yes, it’s a library, but it’s the biggest library in town and there’s lots to do within its geometric walls. With hundreds of free-to-use computers, WiFi, books, and movies galore, and even a coffee shop right on the premises, this library is more like a gigantic café than your average library. Plus, the structure itself is interesting to walk around with neon-yellow escalators, artwork on exhibit, and views from the tenth floor. The Seattle Aquarium is almost entirely indoors, but still has lots of natural light in some exhibits. Spending a day watching jellyfish, otters, and sea lions enjoy the water while you stay dry is not a bad way to while away a rainy day. Woodland Park Zoo has both indoor and outdoor areas, so it’s not a bad rainy day destination. As a bonus, the zoo often offers discounts on rainy days, which might just help make wearing that raincoat a little more appealing. Check the website to see if the rainy day discount is on. Discounts will get you 50 percent off zoo admission for up to four people. Pacific Science Center is an all-indoor science wonderland. Check out the latest exhibit and maybe learn a little something along the way. Exhibits include permanent as well as traveling ones that have brought in some pretty high-profile items, such as King Tut and Titanic artifacts. There’s also a massive IMAX theater that shows nature and science films, as well as broad release movies. At the heart of Volunteer Park, Volunteer Park Conservatory is a glasshouse filled with botanical life from around the world. Explore cactus, fern, seasonal plants, and ponds, and do it all with outdoor light streaming in. This may be the closest to being outside while being inside you can get in Seattle. If a gym doesn’t float your boat, Seattle has a few rock climbing gyms where you can buy a day pass instead of signing up for a membership. Stone Gardens, Seattle Bouldering Project, and Vertical World all offer day rates as well as regular memberships. Theo Chocolate is a Seattle staple with fair trade and organic chocolate that comes in all kinds of unique flavors. You can visit the onsite shop for free and try a bit of just about anything Theo sells, but taking a tour of the factory is fun for chocolate fans of all ages. Plus, there’s chocolate tasting! Starbucks Reserve Roastery and Tasting Room is a beautiful facility just up the street from downtown. Take a seat at one of the bars and try a special brew, or kick back in the lending library and read a book or bring along your laptop. There’s no shortage of venues and theaters in Seattle. For families, the Seattle Children’s Theater has shows year-round geared toward younger audiences. For teens and adults, any number of plays, musicals, comedians, and headlining tours come through every place from the 5th Avenue to the Paramount to ACT Theatre to KeyArena. If you’re stuck inside, it never hurts to check the events schedules to see who’s on that day. For families, indoor play centers are a great option. Aside from children’s museums, there are always pizza arcades like Chuck E. Cheese, as well as more local options like the Family Fun Center in Tukwila. At Family Fun Center, you can bowl, drive bumper cars, ride some rides, and climb on giant playgrounds. There are even more outdoors activities if the weather is decent, too. After years of renovations, the Seattle Space Needle has been completely redone and opened for visitors. 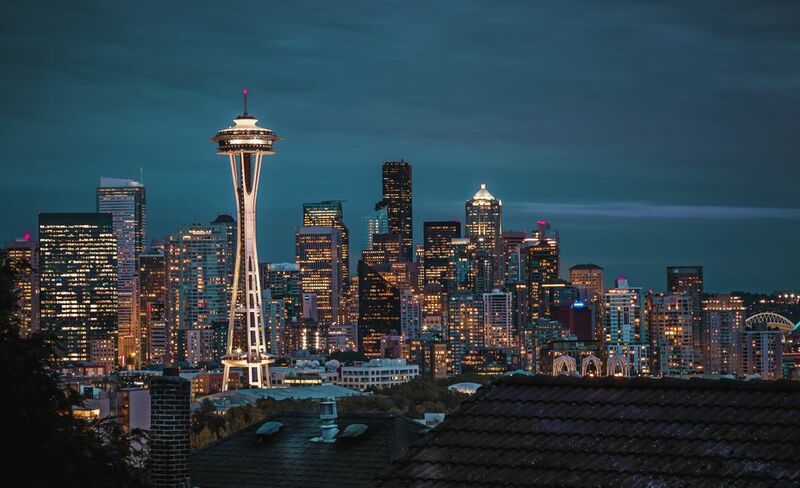 Purchase one ticket to see both observation decks of the needle—both of which has floor-to-ceiling windows that overlook Mount Rainier, Elliott Bay, and the Puget Sound. There's also a new section with the world's first revolving glass floors, so you can look down to the city skyline below your feet. When hunger strikes, tuck into local craft beer, wine, and bites at the Atmost Wine Bar, which also has a glass floor more than 500 feet in the air.